Wirebonding is a process in which silicon die, instead of being packaged as a standard electronics component (like a QFN), are placed directly on a PCB and connected to the circuit board. Normally, the die is coated in plastic and wired to standard pins, which create a chip footprint that is easily solderable. With wirebonding, the silicone is still exposed, and wires are directly bonded from the exposed contacts on the die to the circuit board. Since these dies have not had plastic molding added they are much smaller and thinner. The process is also cheaper at scale than standard SMT. 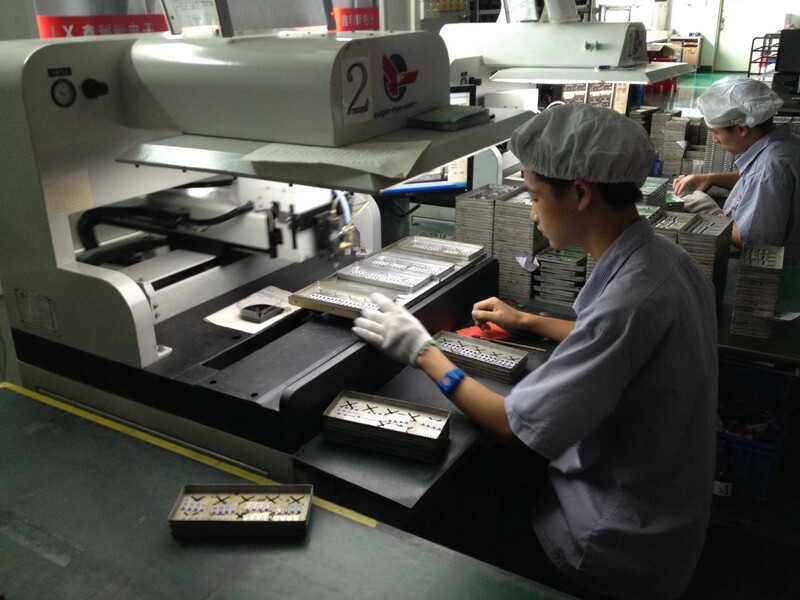 As part of bunnie’s summer 2015 Manufacturing and Supply Chain Bootcamp, we visited the LXDZC Wirebonding Factory in the Bao’an district, a Northwest part of Shenzhen, to see this process in action. Below is a summary of how/why an individual or research group might use this factory and what issues to look out for. 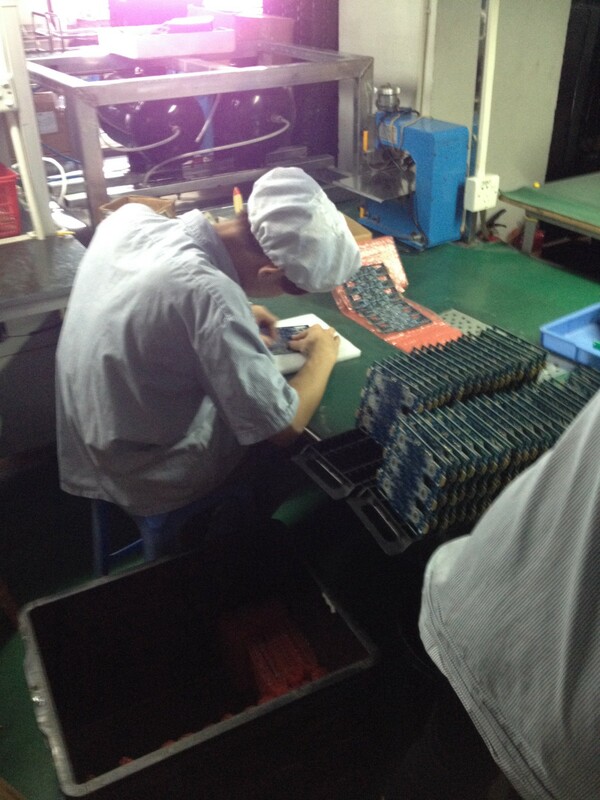 Additionally, I will describe the factory’s wirebonding process. 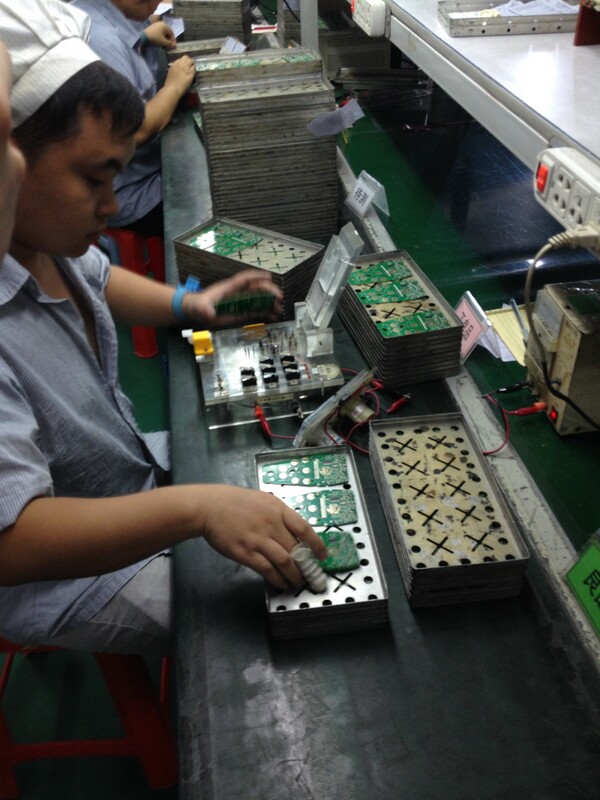 Silicon dies are sourced by customers and enter the factory with the PCBs. The factory does not have relationships or help with sources silicon die. This part of the process is the biggest hurdle for budding designers. Reputable chip manufacturers frequently will not sell silicon die, for IP, brand, and support reasons. Failed quality control and poor design process on your part can result in secondary brand damage for them. In many cases, they do not have the support staff to help you with the wirebonding process. Finally, they may not actually touch/see the actual silicon before it is molded into a standard package. In this instance, they would need to create a special process for shipping die before their molding step in order to sell you the raw die. In general, silicon dies come on a large wafer with several thousands pieces created and batched together. This wafer is tested, and die that fail a full quality check are marked with a small dot (called ‘inking the die’). Typically, failed parts represent a large percentage of the original batch. Inked die is then cut before it is sent to the packaging stage. Chip manufacturers may not have a process for removing the inked, bad die from a batch at this early stage. Selling the full inked die set puts them at risk for secondhand, broken parts (which may boot fine, but have other defects) ending up on the grey market. It also may add a sorting step to your personal process. An additional issue to consider is that machinery that adds the packaging and final die process for chip manufacturers typically works on a full wafer batch at a time — therefore, partial wafers are useless to the chip manufacturer. This means, if you’re interested in sourcing a die, you’ll generally be required to buy a full wafer (5–10,000 pieces). Generally speaking, these issues make it difficult for designers on a budget (and without a reputation or a big PO as leverage) to use high cost or highly custom chips. However, it is not unreasonable to source generic and knock-off microcontrollers at large quantities for a price that can work in a research budget. 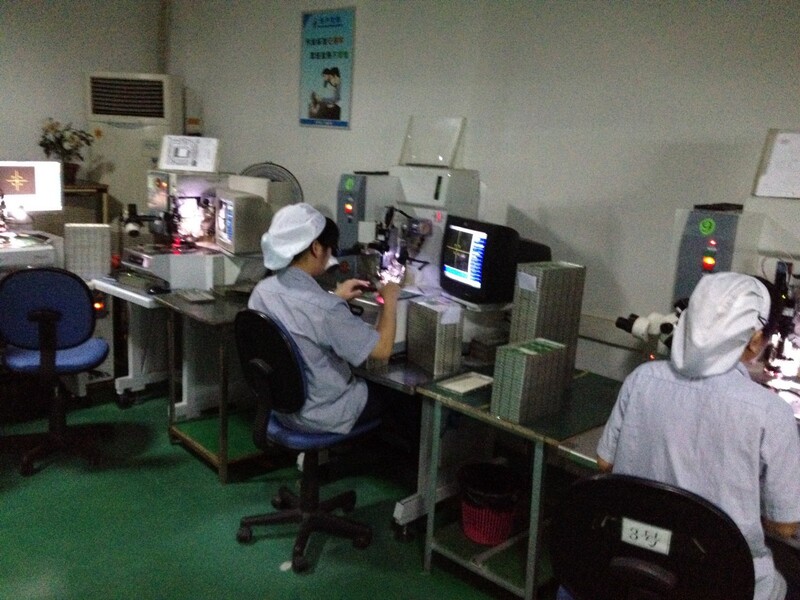 Some Chinese brands that we saw in the factory that could work for sourcing include General Plus, SSI, and Holtek. If you’re interested in the wirebonding process, these brands can be purchased and sourced at large quantity for reasonable cost. It would be possible to design your part for a mainstream processor (like Freescale), find a comparable General Plus/Holtek chip, purchase an emulator for that new chip on taobao.com or in Hua Cheng Bei, and port your code over. 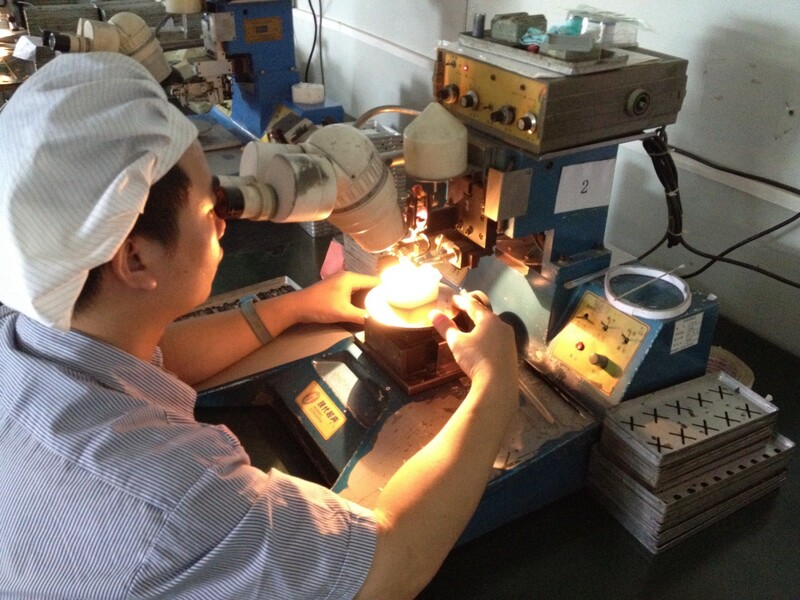 After sourcing your die, you can send the PCB before or after your standard SMT process, though almost all of the boards we saw had already been through SMT, making this wirebonding stage the final step in board manufacturing. 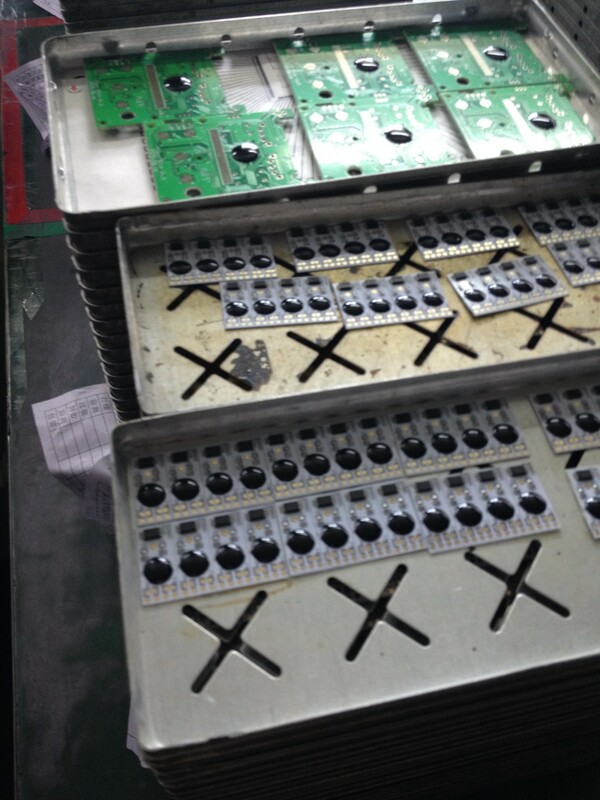 The first step is to clean the boards, which is done by hand for single boards and by a machine for panelized boards. Cleaning the boards by hand. The second step is to place the die onto the board, again by hand (one person places a small amount of glue down the ground of the board, and the second person uses a small tool capable of picking up 4 small die at once and places them onto the boards). This process can again be automated for panelized designs. Almost always the die has a ground plane that is attached to the ground plane of the board. The pins are exposed from the top. 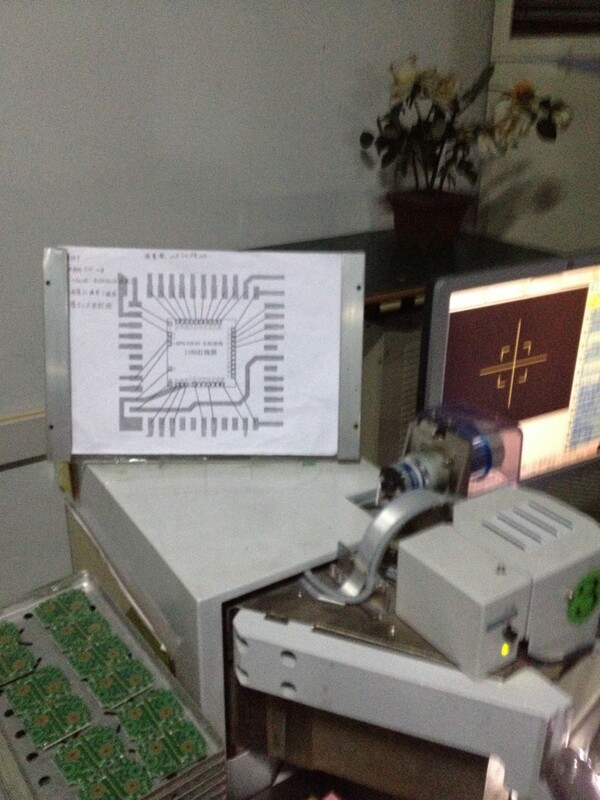 The alignment of the chip on the board does not have to be precise beyond general orientation, because the wirebonding machine uses optical sensing to attach the wires to the die. Placing the die on the boards by hand. Machine for placing the die on the boards. The placed die on the boards, before wirebonding. The next step is the actual wirebonding. Dies have a glass layer on top, with holes that provide access to a metal oxide layer. The composition of this layer dictates what wire material can be bonded to it. Typically aluminum and gold are used, but copper is becoming a more common option (mainly outside of China). 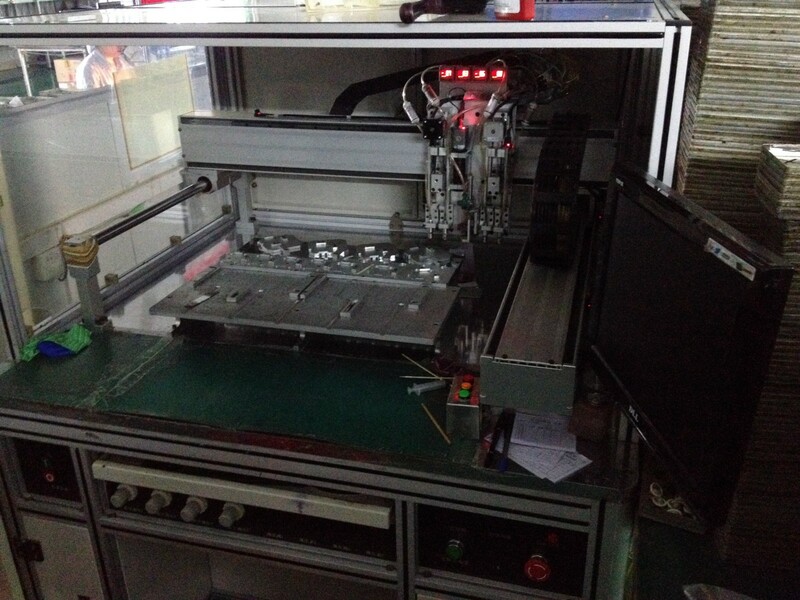 The wirebonding machine is programmed to optically align itself to the chip and the pads, and then automatically draw the wire from the die pins to the PCB pads one by one. The wires are bonded at each end using an ultrasonic joining process. The machine is works very quickly, bonding an entire 40-pin package in a matter of seconds. Wirebonding diagram on one of the machines. The final result looks like thin spider silk holding the die down. The wire can be many gauges and can handle correspondingly large currents depending on size (up to a couple amps). The wires generally should not cross, although there is a process for more complicated wire geometries if they must (and/or the die(s) do not have all of their pins on an edge). It is possible to stack multiple die, and also to mount multiple die in a modular way on one ground pad. Wirebonding multiple die together with one pad/process represents a compelling option for custom, miniaturized circuit design. 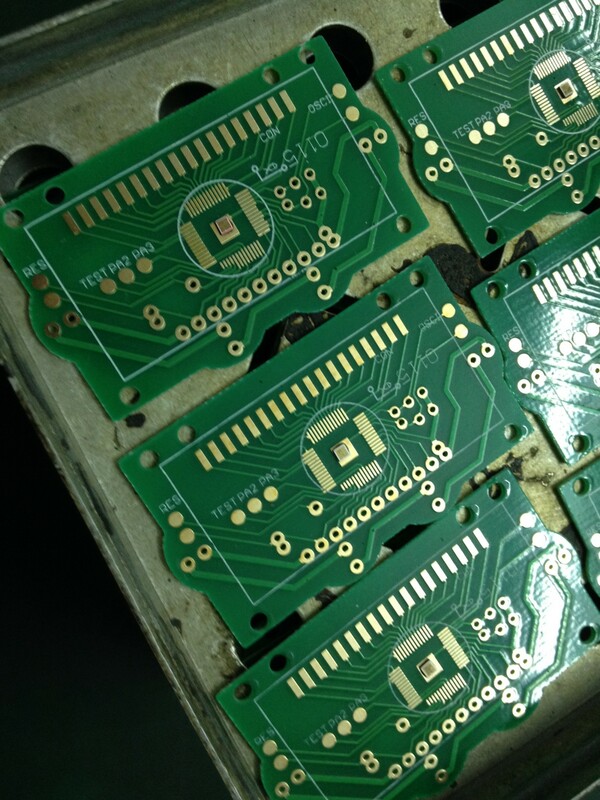 This wirebonding process also works on flexible PCBs, although there are some slight constraints on board thickness/rigidity (the board must withstand the ultrasonic bonding). After wirebonding, the chips move on to testing. Here, a small group of people use test jigs (which are provided by the circuit designer) to verify that the wirebonding process has worked. If there is a failure, there is a manual inspection station followed by a manual wirebonding station for rework. Manual wirebonding station for re-working boards that fail testing. The final part of the process is the addition of a protective epoxy resin. This is a specialty material that is sourced from the US. As its purpose is to protect the wires and the dye, it becomes very rigid once it has been cured. It is applied automatically by different CNC style machines, which heat the epoxy slightly so it is more viscous during application. It is typically applied as a circular blob, but the machines can be programmed to create other shapes. For our visit, one of their machines was running with optical alignment for batch processing, while the other was set up with a rigid fixture to mount boards. 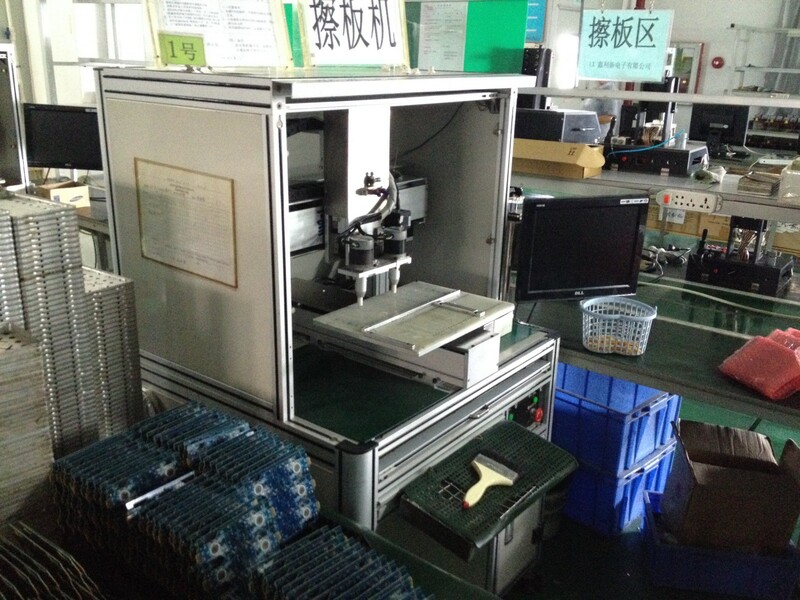 Optical tracking machine for depositing epoxy. Fixtured machine for depositing epoxy. Wet epoxy on the boards. The final result is a black circular liquid on the chip. This can be colored clear, red, or green, but black is the most common. 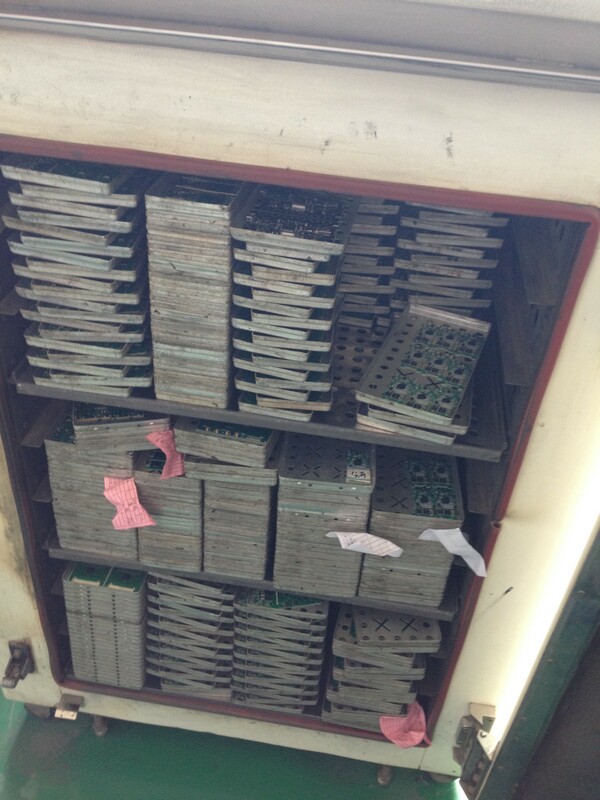 The applied epoxy is then cured through heat in an oven room, and the chips are ready to ship. The addition of epoxy is not necessary if the PCBs are going to be mounted in a protective case. 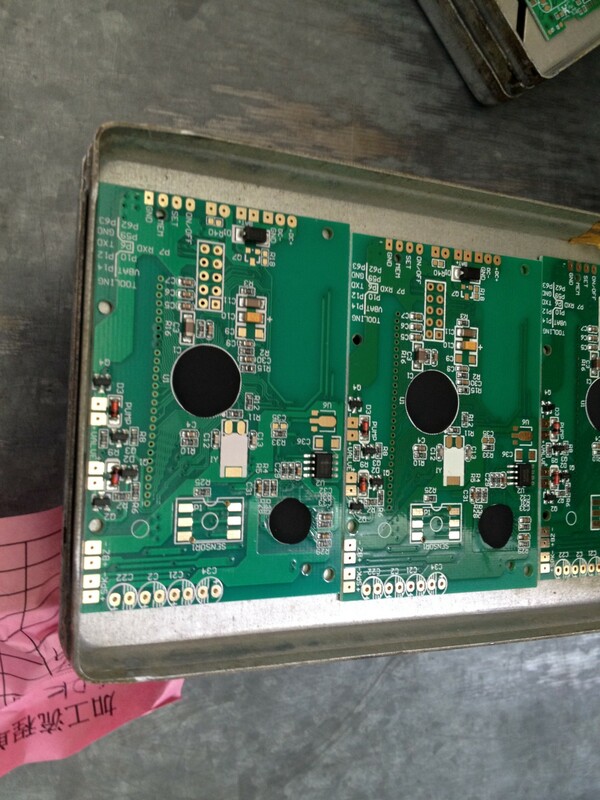 The wire bonds are prone to break if touched directly, but they can withstand normal vibration as long as the surface of the PCB is isolated from the environment. Wirebonding is 1/6 the cost of tradition QFN, and quotes are typically per pin. Generally speaking, one pin costs one RMB cent (1/6 US cent) for wirebonding, and six RMB cents (1 US cent) for SMT. Testing time is free for a ten second test (per board), and costs one RMB cent per second after ten seconds. As the designer, you must create the test and instruct the workers how to use it. Prototypes cost 10–15 RMB ($1.75–2.50 USD). The costs are a huge incentive, and based on the designs we saw in the factory, this was the primary driver for most of their business. For a low volume designer, the cost is certainly appealing. Test jig/specs for small runs and sourcing are the real cost barriers. There are numerous other benefits outside of cost, which may make it worth buying large quantities of die and adding this process to your design. Dies are much lower profile, have much smaller footprints, and are highly customizable when multiple dies are bonded together. 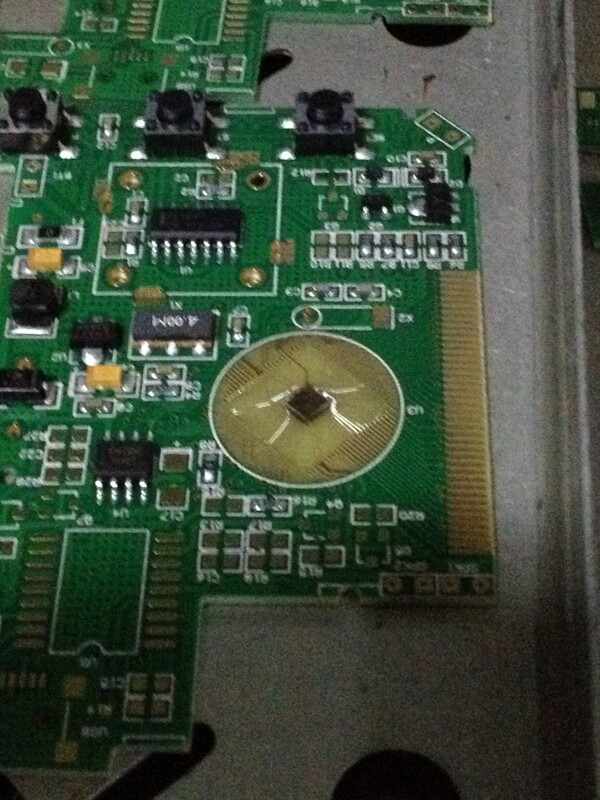 It is possible to recess the die into the PCB, creating a completely flat/flush design. Dies are also lighter weight than their packaged brethren, and work with flex PCBs. Designs using this process can also be obfuscated using the black epoxy, making it harder to reverse engineer your board without serious effort, if security is a concern. Generally speaking, the wirebonding process is better than traditional SMT— it is cheaper, smaller, thinner, lighter, and more secure. These are marginal benefits though, and the barrier to entry remains somewhat high because die sourcing is difficult. This process could present an appealing option for designers looking to push the limits of size and weight. I personally found this trip to be one of the most eye opening and elucidating visits from the Bootcamp experience. I am excited most by the possibilities of designing small circuits that could fit in your ear (for audio applications), in your clothes, or even perhaps injection molding a completely flat PCB design into a thin plastic for integration ultra-thin/sleek consumer products. I’d love to push the limits of wirebonding with this factory — perhaps removing the traditional PCB entirely from the process and simply wirebonding/molding an entire complex circuit design/package together.